Alchemical symbols - what has become of the symbols used in Alchemical Manuscripts? Practicioners of Alchemy have long used a series of symbols as a notation for the most frequent subjects of study. The picture left is a typical example from a 7th century Alchemist. What has become of these symbols? Alchemical symbols were used by Indian, Chinese and Egyptian alchemists from times unknown and were proliferated by medieval Arabic and European writers. European alchemists, natural philosophers, chemists, and apothecaries built a specific system of symbols that was based on the symbols that were passed down from the ancients. The manuscripts on alchemy of the 16th and 17th century in particular, regularly contained tables with alchemical symbols as used in those particular manuscripts. Although many alchemists used similar symbols for the main substances, never was there one comprehensive symbol set. 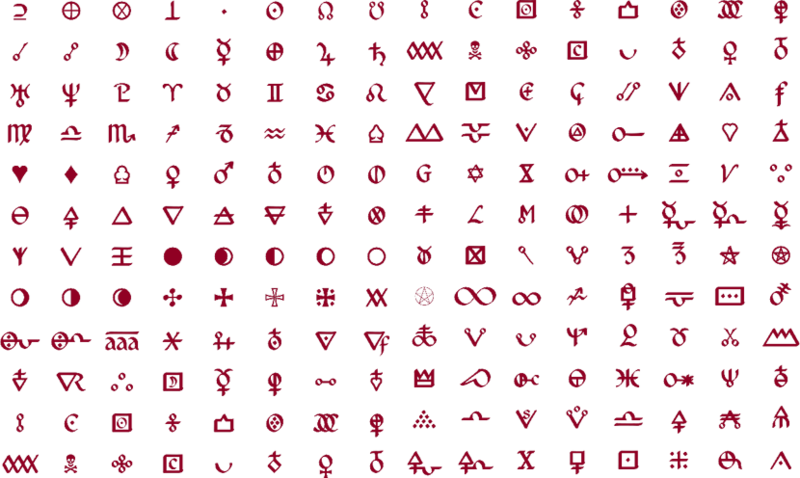 Prof. Newman's work was the basis for this formalization of alchemical symbols in Unicode. Unicode is a computing industry standard for the consistent encoding, representation and handling of text expressed in most of the world's writing systems. The formalization of a standard code set for alchemical symbols is of benefit for those who use these symbols in modern text, be it historians, chemists, philosophers of nature, or literary scholars who research and record their findings in the field of alchemy. 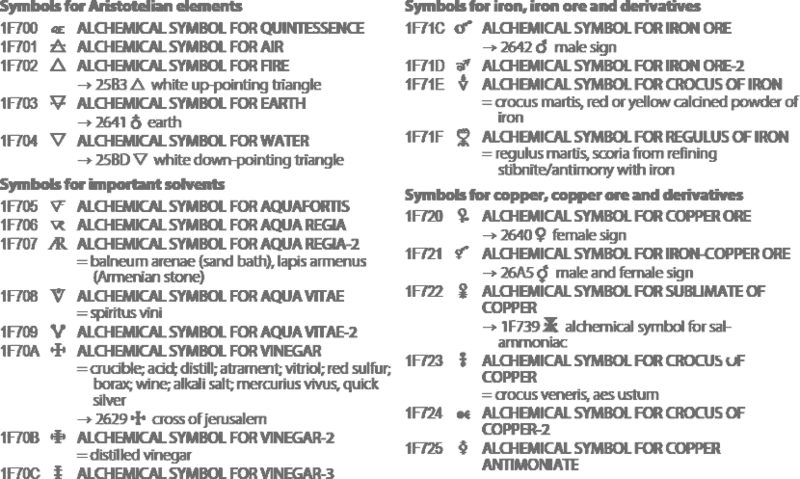 For a complete overview of Unicode symbols and their meaning, refer to this sheet. A handy overview of the meanings of the most essential symbols can be found here on the Indiana University website. 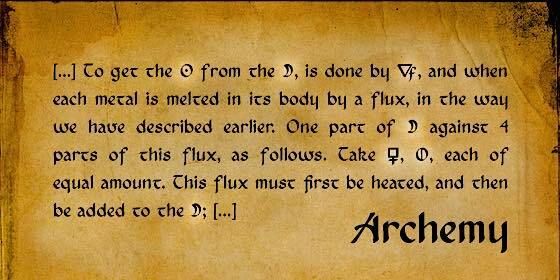 Although the above mentioned "Archemy" set uses the Unicode U+E000 range instead of U+1F70 (alchemy unicode avant la lettre), it is still one of the most comprehensive fonts in the field. It is available here. Members of IGF can request a free copy of the font for use in notes for the Foundation. In 2013 the "Newton" font was released, which closely matches the Archemy font. This font is free and can be downloaded here. The fonts mentioned above provide a list of the most frequently used symbols but they are by no means complete. 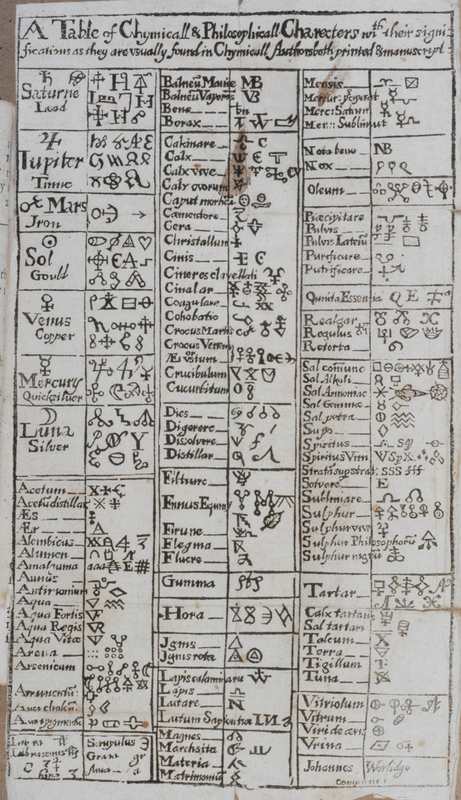 Below, the table of alchemical symbols from Basil Valentine's, “The Last Will and Testament”, 1670, for example, contains dozens of symbols not included yet in any of the above fonts. The various symbols for different weights and measures alone could fill a number of pages. Dr. Schein's, "Collected Writings", available here, contains a table of the most frequently used weights and measures.